Do you have a blog on your photography website? Not sure if there is a point of having one? 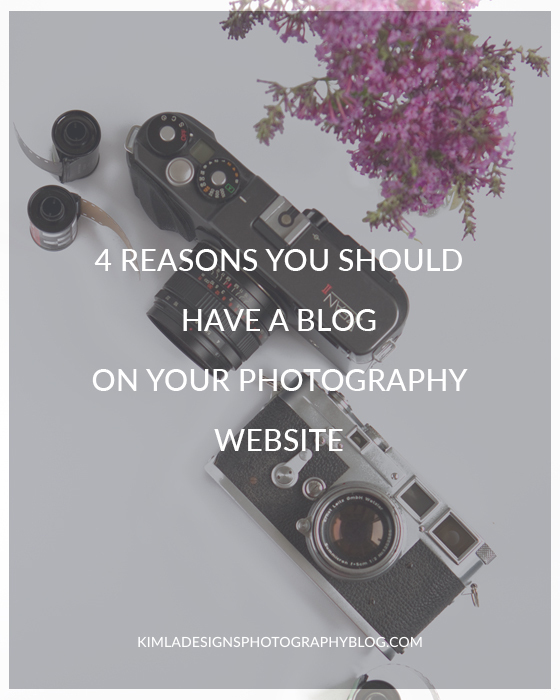 I'm here today with 4 reasons your photography website needs a Blog. Even if you are super busy photographer, with active social media accounts and many followers, you should consider to have a blog. 1. SEO . Having a blog helps boost your website SEO, for free. Good, consistent blog content, shared online is generating fantastic traffic to your website. Your website is more visible for your potential customers and if you are looking to see your website on first page of google with any local search start a blog today. 2. Personal connection. You can communicate with your readers/potential customers through your blog posts. Tell them why you are photographer, what motivates you, how you work and let them feel more comfortable with you before they hire you. You can show you not only a person behind camera, you are you. 3. Showcase your work. Having a blog gives you an opportunity to show MORE quality content. You are not able to do it in your portfolio but having a blog updated regularly, you will. There is no need to be super active with your blog post. Be selective. Always remember to show your best of bests. Think about recent sessions posts, behind the scenes posts, slideshows, mini galleries for your customers etc. All these can be easily shared by your readers/customers, for free again. I know that people love to see and share their photos from their photographer's blog. You will have great example of word-of-mouth marketing. All these content will also stay on your website, will be view many times. There are no social media algorithms here and bad quality facebook images. This is Your website. 4. Marketing tool. Blogging helps you build a strong brand and find the right customers, especially if you are just starting out. As I mentioned early, your content can be shared many times, it will give people a reason to come back and book you. You can blog about your seasonal special photography offers and events. All your blog content stay on your website and you can easily share it anytime over your social media accounts, tag other people, mention local vendors and businesses. Yes, it's more easy to network with other brands and photographers and we all need them when building and growing our business if we like it or not. Are you still not sure if you should have a blog on your website ? Check my free 120 Blog Posts Ideas for Photographers and start blogging today!